On January 2, 2019, we will begin accepting reservations for any 2019 spring or fall weekends, or for any summer vacation weekly stays in July and August. Shorter stays in July & August may be reserved as your dates get closer (4 months prior for 4 nights, 3 months in advance for 3 nights and 2 months before your arrival date for summer weekend stays). If reserving for a month or longer (such as our “short” seasonals in the spring or fall), you may call in December. Reservations may be made by phone at (860) 376-1081, you may email Sunfox at Request for Reservation or you may also check availability, rates and make an on-line reservation using our “Remote Reserver” (which will be re-activated on January 2 for 2019 reservations) for any spring and fall weekends, as well as for summer dates. If your stay is for less than 7 nights during the peak summer season (any stay in July or August), we begin accepting those reservations based on the length of your stay. For example, if you are staying 4 summer nights, you may reserve 4 months in advance (such as March 15 for a July 15 arrival)…or for 3 summer nights, you may reserve 3 months in advance of your arrival date, while summer weekends may be reserved 2 months in advance. This allows families making weekly (or longer) vacation plans an opportunity to make their summer vacation reservations prior to all sites filling up with summer weekend reservations. 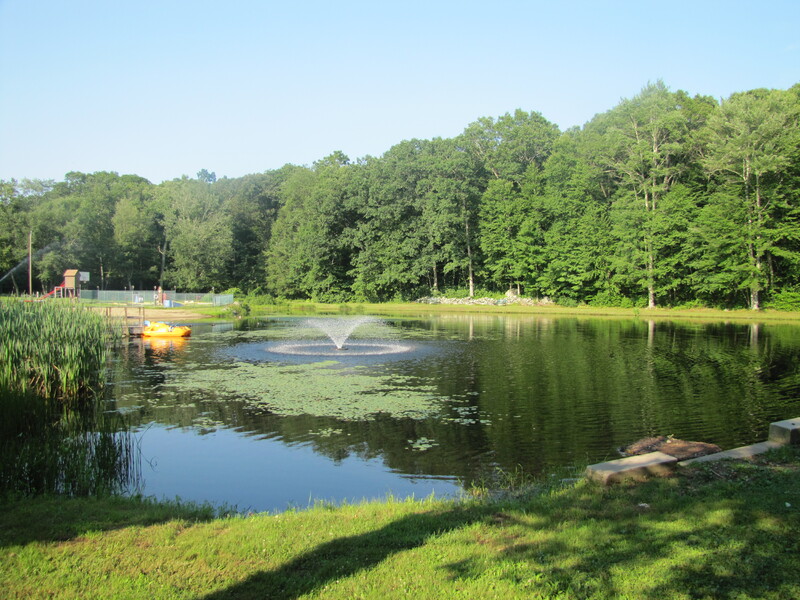 For campers without advance reservations (such as those off-the-road travelers), mid-week site availability is assured during the spring and fall, and is also guaranteed in the summer. If you arrive without reservations and we can’t find you a site with at least water, electric and cable TV for a mid-week stay, we will give you $5 for gas and directions to another local campground that may have a vacancy. For any stay encompassing a weekend, we strongly suggest calling in advance. When making reservations, a deposit of 50% will be due when reserving, with remaining balance due upon arrival. Upon making an advance reservation, your reservation request will be held for 7 days from the date you made your reservation, by which time we must receive required deposit (unless making a reservation for an arrival within 14 days, for which a deposit will be due immediately). Deposit payment may be made by credit card or personal check, provided check is received by Sunfox Campground within 7 days of making your reservation and at least 30 days prior to your arrival date. If we do not receive the required deposit within 7 days of making the reservation, your request for reservation may be canceled without notice. Any reservation made within 14 days of arrival date will require immediate payment via MasterCard, Visa or Discover. Upon receiving a deposit, Sunfox will send a confirmation stating that the deposit was received. Please take the time to carefully read your confirmation notice, checking dates, hook-ups and campground policies. Reservation balance is due on arrival, and must be paid by MasterCard, Visa, Discover or cash (sorry, no checks upon arrival). For reservations with paid deposits, we will hold your site until noon of the day following your scheduled date of arrival, at which time the site may be released and re-booked without compensation. Regretfully, we cannot accept personal checks during your stay. We are pleased to offer our campers the option of requesting a reservation via email with our “Request a Reservation“, or you may also check availability, rates and make an on-line reservation using our new “Remote Reserver“….but to be perfectly honest, we still prefer reservations made by phone at (860) 376-1081 (especially for any extended stays of greater than 7 nights). It may seem old-fashioned, but because so many people have specific requests regarding hook-ups, locations and friends that they may wish to camp near, our reservation staff would be happy to directly answer any questions you may have. Making a camping reservation is unlike ordering a DVD or concert tickets over the internet, as there are so many variables. That being said, email reservation requests are processed within 24 hours, and often within a few minutes of your sending. If you need more immediate assistance (such as a reservation for an arrival within the next 7 days), please call us. If there is availability for your on-line request for reservation, we will let you know. We will also let you know if we are already full for the dates or hook-ups you have requested. If you do not receive a reply within 48 hours, please call us or re-send your email, as in rare instances your request may be blocked by your sending computer, or filtered out as perceived “SPAM”. Reservations may be made starting January 2 for any spring or fall weekends, as well as for any summer vacation stay of at least 7 nights. If you wish to reserve a shorter stay during the summer (any stay in July or August), we start taking reservations based on the length of your stay. For example, if you are reserving 3 nights, you may reserve 3 months in advance of your desired arrival, with summer weekend reservations taken 2 months in advance of your desired arrival date. Unless otherwise noted, such as for our long term seasonal sites, all rates are based on ONE FAMILY PER SITE. For purposes of rates and site assignments, a “family” is defined as two adult parents and up to 4 of their unmarried children under the age of 21. For all other situations, the rate is based on up to 4 adults, and all members of a non-family camping group must be at least 21 years of age. All reservations are limited to one family per site, with no more than 4 adults, with extra person fees applied to extra children beyond base rate for a family of 6. If a second family chooses to camp on the same site as another family (or more than 4 adults), they will be charged the full site rate for the camping period, as if another separate and additional site was reserved. Although we will do our best to honor any specific site requests that you may have, we cannot guarantee a specific site number. If you have reserved a site for a week or longer stay, we will attempt to contact you in advance of your arrival in the event that the specific site number is, for some unforeseen reason, no longer available. When making a reservation, please be sure to let us know of any particular requests you may have, including desired hook-ups, proximity to facilities or friends with whom you are camping. We will do our very best to accommodate your requests. Please understand that many factors are considered in assigning sites, most notably: date reservation was made, duration of stay, and desire to keep multi-site reservations together. Site assignments are not based on your time of arrival on your date of check-in, so those arriving early should not expect staff to relocate another camper’s assigned site simply because that camper has not yet arrived. Please be sure to include your arrival and departure dates, desired hook-ups, size of RV and your contact phone number if you are using our “Request a Reservation“, or feel free to call us at (860) 376-1081. You may also check availability, rates and make an on-line reservation using our new “Remote Reserver“. Join Our Sunfox E-Mail List!